While the iPhone 6s and iPhone 6s Plus are designed with Series 7000 aluminum, which has a stronger and marginally thicker composition compared to Series 6000 aluminum used on the iPhone 6 and iPhone 6 Plus, the new smartphones weigh more primarily due to their 3D Touch displays. 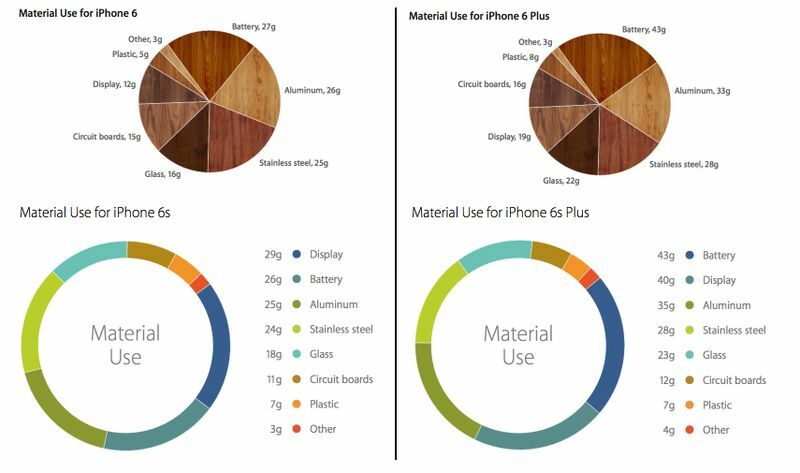 The material breakdowns for the iPhone 6s and iPhone 6s Plus list the display weighing 29 grams and 40 grams respectively, while the iPhone 6 and iPhone 6 Plus displays weigh 12 grams and 19 grams respectively. Meanwhile, the individual weights of the aluminum, battery, stainless steel, glass, circuit boards, plastic and other materials on the iPhone 6s and iPhone 6s Plus are very similar to the iPhone 6 and iPhone 6 Plus. iPhone 6s and iPhone 6s Plus weigh 143 grams (5.04 ounces) and 192 grams (6.77 ounces) respectively, while the iPhone 6 and iPhone 6 Plus weigh 129 grams (4.55 ounces) and 172 grams (6.07 ounces) respectively. Added weight and a smaller battery, all to deliver 3D Touch which I worry may be a confusing/buggy usability concern. Hopefully I'm wrong and I end up loving it. Battery life has not changed for years on iPhone. I don't get the constant complaining. It will last at least a day with normal use. Are we seriously complaining about an increase of HALF AN OUNCE? Just because the battery is smaller doesn't mean it automatically lasts less than last year's model. This year's processor (like always) is more power efficient. This is bad, however, I have got used to it being bad now, so that now I don't see any reason for it to be better. Tell me, if battery life of just 1 day is perfectly fine for you. I expect you would feel absolutely fine if every battery operated device you own or ever bought also only lasted 1 day between charges.... yes? Because this is the internets and the internets is best at whining. 3D Touch is a big deal, I can see Apple evolving iOS A LOT once 3D Touch is offered on the entire product line. is that a pie chart with various wood textures to represent various non-wood materials? you guys tarred and feathered scott forstall and chased him out of town, and you're going to let THIS slide?? That would explain why 3D Touch didn't make its way on to the iPad Pro. Not charging your phone everyday is a big deal too.